My girlfriend’s family (Judith, who was under the spotlight in a previous newsletter) have a flea market background. They never buy anything new, but always second hand. This impacted me and I quickly discovered a passion for recycling and reusing. I heard about OUNI when they began to fundraise. Vanessa, one of the founding members who also works in the EIB, did some advertising there that I noticed. 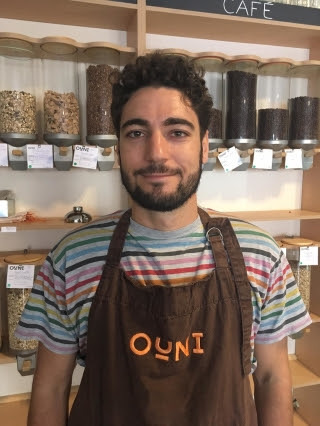 For me, what interested me in OUNI was the idea of creating a space that was aiming to be both ecological and social, which allowed you to buy local products at the same time as forging links with new people. In addition, I also think that even OUNI’s name itself is really apt and its link with the Luxembourgish language is one to be applauded. There have also been times when the agents there, when they spot me arriving with so much packaging, stop me to ask whether it’s waste from a company. In fact, companies only have access to the recycling centre from Tuesday through to Friday, and I go on a Saturday. But, when I explained that it was a cooperative, they fortunately turned a blind eye. The advantage is that I already know my way round the centre and so I know exactly where each type of waste has to go. Even if the staff there are always happy to help. My favourite product is without a doubt the apple muffin. I’ve got into the habit of grabbing one when I work a shift and I eat it on the way to the recycling centre!